BLACK MASS reminds me a lot of THE PROGRAM. Both are big glossy biopics on topics I am fascinated by, whose source books I have read, and whose cast and crew I admire. I found both to be well-made but ultimately rather dull linear paint-by-numbers narratives. And in both cases, the real reason to watch are the outstanding acting performances. 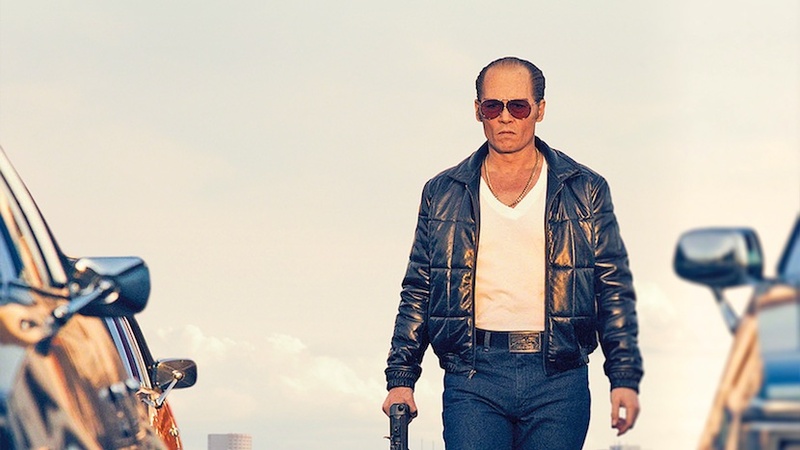 In the case of BLACK MASS, that's Johnny Depp as the infamous South Boston gangster Jimmy "Whitey" Bulger and Joel Edgerton as his childhood friend FBI Agent John Connolly. The story of BLACK MASS is so messed up you couldn't make it up, and speaks volumes about the incestuous corrupt politics of Boston in the 70s and 80s. In what other universe of normality could Billy Bulger rise to be State Senator while at the same time openly consorting with his elder brother, a known felon? And what kind of messed up world does their mutual childhood friend decide to co-opt Jimmy as an informant, so that while he and the FBI take down the mafia in a Rico case, Jimmy can move in on their territory? The resulting movie plays like a corrupt police procedural. We start off with the framing device of Jimmy's former gang giving evidence against him in exchange for lighter sentences. And then we work back to seeing the unholy alliance between Connolly and Bulger set up. For Bulger, this deal is pure business. The man is a psychopath in the best tradition of the Krays, kind to do his doting mother and little old ladies but absolutely ruthless as a businessman. It becomes clear that he's not actually giving the FBI anything unless it's to further his own business interests, and in exchange he's basically getting immunity from investigation and the location of anyone snitching on him. Playing the role with a pitch perfect accent under layers of superb make-up, Depp is genuinely frightening and fascinating in one of his career best performances. But arguably the most fascinating character is that of John Connolly, played with tragic bravado by Edgerton. It's hard to know just what motivates Connolly or when he realises, if ever, how deep he's complicit in Bulger's murders. At the beginning it feels like he's engaging in a business quid pro quo - bringing Bulger in to help the FBI take down a mutual enemy - the mafia. But it's also clear that Connolly's in love with a Romantic ideal of what it means to grow up poor in South Boston. He mythologises the somewhat vague idea that Bulger helped him out as a kid, and evidently he was a close friend of both Bulger brothers. He seems to think that growing up together demands loyalty no matter what the cost. I mean, we see how much money Bulger makes, and we can see that this translates into a flash suit and gold watch for Connolly but is that really it? Is this what he sold his soul for? I am reminded of the line from A MAN FOR ALL SEASONS where a lamenting Sir Thomas More says something along the following lines to Richard Rich "What does it profit a man to sell his soul for the whole world. But for Wales?!" In support, I thought Dakota Johnson convincing as Bulger's babymama and Jesse Plemons impressive under heavy make-up as Bulger's side-kick. I was, however, a bit disappointed by the handling of Billy Bulger. Was he really not complicit at all? Is there a limit as to what they can say/prove on film? And could they not find an actor with a more convincing Boston accent than the usually superb Benedict Cumberbatch? This is particularly noticeable in a scene he plays opposite the Bulger mother, who is presumably South Boston through and through. Behind the lens, as I said before, the movie is workmanlike, good quality but nothing surprising or memorable from director Scott Cooper (CRAZY HEART). That's okay - it allows Depp to take centre stage - but it also means that over its two-hour run-time there were patches of boredom as we waited for the cogs to tick over and the years to pass. Also apparently Junkie XL did the soundtrack? I honestly can't say I noticed which is very odd indeed. BLACK MASS has a running time of 124 minutes and is rated R. It played Venice, Telluride, Toronto and London 2015 and was released last month in Australia, the UAE, Iraq, Lebanon, Panama, Puerto Rico, Singapore, Canada, Egypt, Indonesia, Lithuania, the USA, Bolivia, Colombia India and Sweden. It was released earlier in October in Estonia, Iceland, Latvia, Romania, Venezuela, Belgium, Italy, Portugal, Poland, Switzerland, Germany, Denmark, Greece, the Netherlands, New Zealand, Austria and South Africa. It opens on October 21st in the Philippines, on October 22nd in Argentina, Chile, Hong Kong, Croatia, Israel, and Uruguay, on October 23rd in Spain, Finland, Norway and Taiwan, and on October 29th in Kazakhstan, Peru, Serbia, Russia and Ukraine. It opens on November 6th in Cyprus, on November 12th in Brazil, Hungary and Bulgaria, on November 19th in the Czech Republic and Slovakia, on November 20th in Mexico and Turkey, on November 25ht in Belgium, Switzerland and France, on November 27th in the UK and Ireland, on December 3rd in Slovenia and on January 30th in Japan.